CIRCLEVILLE – Circleville High School Senior Sieara Joelle Carroll has officially Committed to Capital University track and field team. 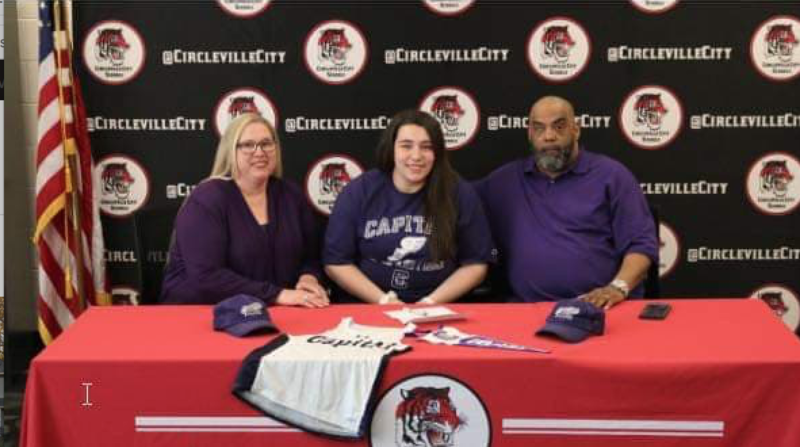 Carroll has already received Capital University merit scholarship and Capital University Presidential scholarship totaling $20,000. She plans to study Sociology and African American Studies and eventually attend Capital University Law School. During Carolls High School Career she has had, 4 years Varsity Track and Field, 2 years Varsity Football cheerleader, 2 years Basketball cheerleader, 4 years show choir, 3 years symphonic choir, 2 years color guard, 2 years FCCLA member, 4 years Drug Free Club, 1 year Art Club, 2 years high school musical, and 1 year Mock Trial. Please congratulate Sieara Joelle Carroll and parents are Keith and Melissa Carroll of Circleville!